Government Shuts Down But Perversions Persist - This Can't Be Happening! On the first day of the federal government shut-down, as hundreds of tourists were turned away from the shuttered Liberty Bell and other fabled sites within the Independence National Historical Park in downtown Philadelphia, Richard Dyost stood near the building housing the Bell and received a big laugh. 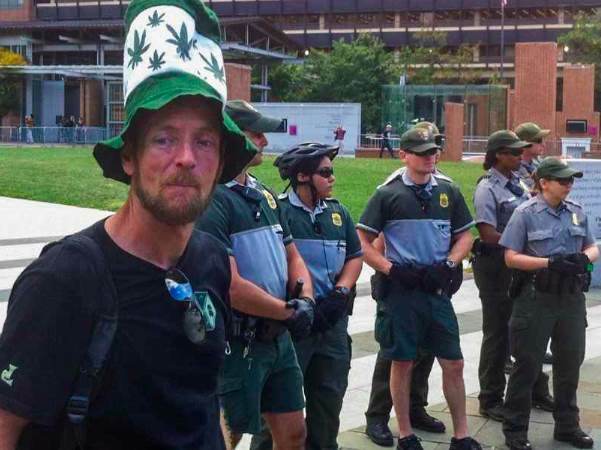 Dyost, wearing a tall hat featuring marijuana leaves, was among a group that included site-visit-spurned tourists, who watched federal park rangers and Philadelphia police get ‘punked’ like the people once targeted for pranks on the defunct cable television program named “Punk’d.” These particular law enforcers were pranked by protestors opposed to the federal government’s prohibition of pot. Pro-pot protestors had announced a smoke-out at the Liberty Bell for the afternoon of Tuesday, October 1. Park rangers (working despite the government shut-down), Philadelphia police, as well as representation from the U.S. Attorneys Office in Philadelphia, assembled to arrest protestors attempting to smoke the illegal substance – an enforcement spectacle that has occurred with regularity over the past few months during monthly pro-pot demonstrations outside the Liberty Bell. As the 4:20pm time of the announced smoke-out approached, the rangers put on gloves preparing to arrest protestors. But at 4:20 none of the protestors smoked any marijuana. Instead, many protestors just walked away without ‘firing up’ while uttering comments that ridiculed the assembled law enforcers for their readiness to crack down on protestors instead of keeping the budget impasse-shuttered historic sites open. Dyost, while chuckling at law enforcers getting pranked, scorned the whole idea that the Interior Department and the Justice Department would be ready to expend scarce federal funds to arrest people for consuming a substance that 18-million Americans use regularly (according to stats from the White House Office of National Drug Control Policy) while refusing to staff a highly popular national park historic site. Donne Radford, who lives in Southeast Asia, also questioned the propriety of outlawing marijuana. Radford was born in Denver, Colorado, one of two states where voters last year approved complete legalization of marijuana after years of sanctioned use of marijuana for medical purposes. Republicans on Capitol Hill, particularly far right-wing radicals, triggered the government shut-down with demands to end and/or delay health care reforms initiated by President Obama. A key component of those reforms began on Oct. 1 with U.S. citizens being able to sign-up for lower cost health insurance. There are multiple ironies in this government shut-down resulting from Republicans waging ideological war with the Democratic president. One irony in this battle over health care includes the federal prohibition of marijuana which is widely recognized as medically therapeutic (including in Washington, DC where that city government has approved the medical use of marijuana, as have 18 states). Pot could help eliminate some of the ills in the nation’s health care crisis. The medical use of marijuana dates back to ancient Egyptian and Chinese societies. Since marijuana’s placement in 1970 on the federal government’s drug control Schedule 1 (no medical benefit category) expensive legal battles have occurred to move this substance to Schedule II as having medicinal uses. The Obamacare, that Republicans now deride, is actually a scheme developed by conservatives and once supported by Republicans on Capitol Hill. Obama lost support among many in his voting base by backing away from his 2008 campaign pledge to support a single-payer health care system – essentially an expansion of Medicare to cover all Americans, instead of just the elderly or disabled. Experts agree that the American health care system is expensive and medically inefficient. The per person cost of health care in America, listed in recent studies as $8,508 per year, is more than double the per person cost of all developed nations with far better health care systems than the United States like Australia, England and France. Health outcomes in the U.S. are poor despite the high costs with the U.S. ranking low among developed nations in measures like life expectancy and infant mortality. Obama’s reform legislation, formerly known as the Patient Protection and Affordable Care Act, seeks to reduce the costs of medical care that now consumes nearly 20 percent of all of America’s economic output (GDP). Personal bankruptcies from unpaid medical bills affect nearly two million Americans annually. Studies repeatedly show that that the inability to pay high bills for medical care is the leading cause of personal bankruptcy. The contentious debates over Obamacare don’t even include grave issues like medical errors being the third leading cause of death in America, 23,000 Americans dying each year from anti-biotic resistant bacteria and the 100,000-deaths per year from iatrogenic infections picked up while receiving care inside hospitals. Public opinion polls steadily show the public to be far ahead of elected officials and law enforcers on the issue of pot (and the use of pot’s non-intoxicating cousin – hemp – a plant of many uses from food to fuel to textiles that is also illegal to grow). A May 2012 poll taken in Pennsylvania, for example, showed 82% support for medical marijuana and 38% support for complete legalization of marijuana. Those support levels among Democratic and Republican voters have increased steadily since 2006 in the respected Franklin and Marshall polling. Pennsylvania spent $100.7-million enforcing laws against marijuana possession in 2010 according to an ACLU study released in June. The Republican governor of Pennsylvania, during the past three years, has slashed over a billion dollars from public education, plunging school districts statewide into massive educational cuts and other chaos, but marijuana prosecutions forge ahead.